People in Los Angeles are offering to shelter the homeless in tiny backyard homes. It could be a solution to a spiraling homelessness crisis. Business Insider; by Aria Bendix Sep. 16, 2018, 10:30 AM Read original article here. Los Angeles county is close to building one backyard unit for the homeless as part of its $550,000 pilot program, but the remaining units could be further behind. Despite interest from both landlords and homeless residents, the county faces a number of logistical and legal barriers. While the county continues its efforts, the city is looking to secure funding for its own backyard pilot program. Los Angeles sits at the epicenter of California’s homelessness crisis. In the last six years, homelessness has risen by 75% across most of LA county, while the city itself has more homeless residents than Seattle and San Francisco combined. As the state directs more attention to solving this problem through affordable housing, LA has ramped up its own efforts to house the unsheltered. One of the latest, and most innovative, solutions is the development of accessory dwelling units (ADUs), or small, secondary units located on a residential property — often found in backyards. Prior to 2016, ADUs were considered illegal in many parts of California — a product of the suburban, single-family values of the 1950s. By 2017, California had relaxed many of its restrictions on these units. In August 2017, the county’s Board of Supervisors set aside $550,000 for an ADU pilot program for homeless tenants. Selected landlords will receive either $75,000 to build a backyard unit or $50,000 to convert their unit by bringing it up to code or securing the necessary permits. Payments will be delivered in the form of a loan, which will be forgiven after ten years of housing a homeless resident or family. It’s an unorthodox idea, particularly in an area that has seen protests against homeless housing on more than one occasion. If it works, it could offer a permanent, affordable solution to sheltering a city’s homeless population. While the county has been resolute in its desire to provide for homeless residents, the pilot program is off to a slow start. Though it received interest from about 500 homeowners, the county only has enough funds to support the construction of three new backyard units and the renovation of another three unpermitted structures, such as basements, garages, or attics. The program originally planned to finish construction within 18 months of receiving board approval, but the timeline is no longer clear-cut. According to Larry Newnam, who oversees the project on behalf of the Community Development Commission, the county has identified four “firm” finalists. “We have one owner who has a lot of readiness,” said Newnam. “I’d feel comfortable that, within 60 days, if not sooner, we could get one [unit] under construction.” If that happens, the unit could potentially be finished by early spring. The other units will likely be further behind. “They’re all at different stages,” said the county’s district chief, Connie Chung. Some units are still undergoing review, while others are waiting to secure a contractor or finalize their designs. Even after the units are built, it’s uncertain how the county will measure the project’s success. For Chung, a successful pilot program means actually bringing the vision to life. “If we can get someone in an [ADU] and living in good-quality housing, then I think we’ve met our goal,” she said. But even with clear metrics, it’s up to the board to decide whether the program will continue. It’s also tailor-made for LA zoning laws. According to Chung, nearly three-quarters of the county’s housing stock is single-family, making it difficult to provide enough housing for sheltered residents — let alone its homeless population. ADUs help transform one of the root causes of homelessness, a lack of housing density, into part of the solution. Perhaps the biggest hurdle to overcome is cost. In 2007, the county estimated that it would cost around $355 million a year to transition its homeless residents into affordable housing over the next decade. When you consider all that goes into the pilot homes, the $550,000 allotted for the ADU program is not a lot of money, said Chung. But it could lead to future savings. A recent study of more than 900 homeless residents in LA county found that moving them off the streets and into supportive housing saved around $20 million over the course of two years. That’s because the county spent less on costly services such as emergency room visits, mental health checkups, and crisis interventions. What’s more, the study found that the vast majority of homeless residents — around 96% — stayed in supportive housing for at least a year. For Peinemann, these statistics don’t come as a surprise. “Without exception, in my career in homeless services and housing, which is more than a decade, we see about 95% of people we put into housing who are homeless are there a year later,” he said. To put that into perspective, Peinemann estimates that at least half of homeless residents in traditional shelters in high-cost markets wind up back on the streets. “If you give [homeless people] a chance to have a home and something that they can hold on to, they’ll make it happen,” he said. To stay ahead of the crisis, the city of LA has forged its own strategy for sheltering its homeless population. In 2016, the city passed a $1.2 billion property tax to fund the construction of supportive and affordable housing, along with temporary shelters and facilities for the homeless. Its end goal is to provide 10,000 new units of permanent housing over the next ten years. But even that won’t be enough to house its estimated 55,000 homeless residents. As a supplementary solution, the city is also looking into backyard units. Earlier this year, the city was awarded a $100,000 grant to study the idea as part of Bloomberg Philanthropies’ 2018 Mayors Challenge. This fall, the innovation team will learn whether they’ve won a prize that could be valued up to $5 million to continue their efforts. From there, they would be able to roll out a pilot program that would cater to the temporarily homeless, including those who have recently lost their jobs or fallen behind on rent. Already, cities like Boston and Seattle have unveiled similar projects with the intent of curbing homelessness. In November 2017, Boston launched an 18-month pilot program across three neighborhoods to study the effect of ADUs on affordable housing. 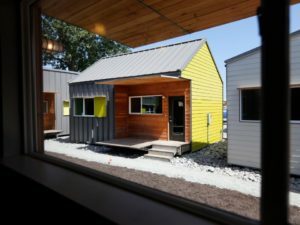 Around the same time, Facing Homelessness, a nonprofit organization in Seattle, began building 125-square-foot units in the city’s Beacon Hill neighborhood. Despite some concerns about neighborhood opposition, locals have been mostly supportive of the program. Based on its initial conversations with residents, LA has seen a similar level of support. According to Amanda Daflos, the director of the mayor’s innovation team, people who expressed interest in becoming landlords were genuinely concerned about helping homeless residents get back on their feet.